Dr. Rosen's background spans all arenas of patient care as a practitioner, administrator, and academician. His specialty from Boston University School of Graduate Dentistry and Sloan Kettering Memorial Cancer Institute was Prosthodontics and Maxillo-Facial Prosthetics and he has since added an MBA from Boston University School of Business Administration. He has served as Director of Hospital Dentistry at New England Medical Center Hospital, Director of the Dental Implant Center at Tufts University School of Dental Medicine, and founder of the Tufts Dental Implant Fellowship Program. 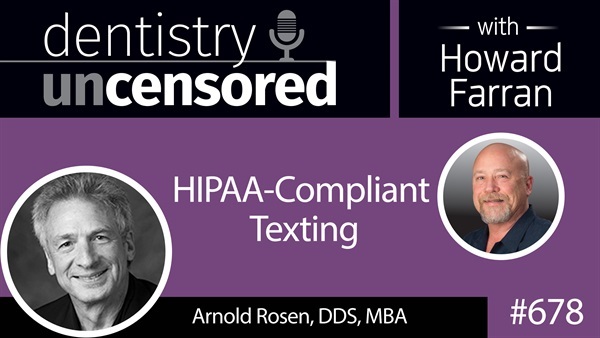 Dr. Rosen has also worked in telemedicine and teledental technologies for several years as a consultant to the international medical forum in Buenos Aires, Argentina, and as cofounder of a telemedicine company and founder of Transcend, Inc.